The airport has been remodeling for the past three years in an effort to showcase more Minnesota-made art. 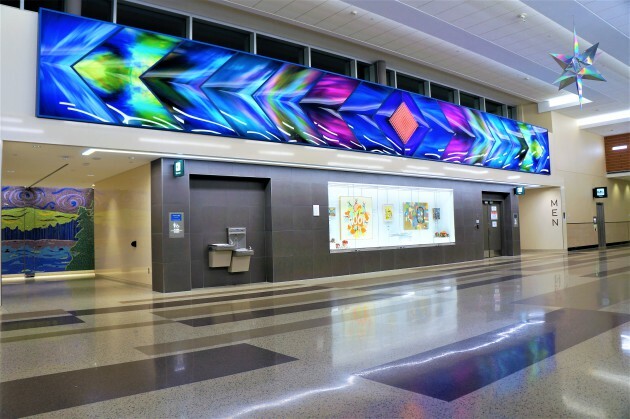 The multi-year project is set to continue through 2023, said Arts @ MSP director Robyne Robinson, making art a central part of the airport experience for the first time. The airport will unveil a series of art installations, all located within Terminal 2, with a private reception Wednesday evening for lawmakers and other V.I.P's. New works include three by Minneapolis artist Philip Noyed, including “L’Etoile du Nord” (above), named for Minnesota's state motto (which is French for "Star of the North"). At 6-feet tall, the installation shines with holographic rainbow vinyl and a crystal prism that casts tiny rainbows of light. Other new works include "Migration," a series of suspended dirigibles that resemble illuminated airships, by Twin Cities sculptor and jewelry designer Danny Saathoff. Minneapolis mosaic artist Stacia Goodman used abstract patterns to create a pair of enormous tile bathroom mosaics inspired by Minnesota scenes (think loons and dogsledding). There's a brand-new display featuring work from Soo Visual Arts Center in south Minneapolis. And Noyed has two more new works on display, both employing LED lights and even more rainbow effects. To Noyed, the rainbow imagery symbolizes that Minnesota is welcome to all -- regardless of race, nationality, creed or sexual orientation. And that fits nicely with the larger vision for art at MSP International Airport. Travelers will find more art in years to come, said Robinson. Terminal 1 already boasts artful bathroom mosaics and the very first film screening room at an American airport. Robinson also promised a "major piece" at Terminal 1, to be unveiled in 2020.